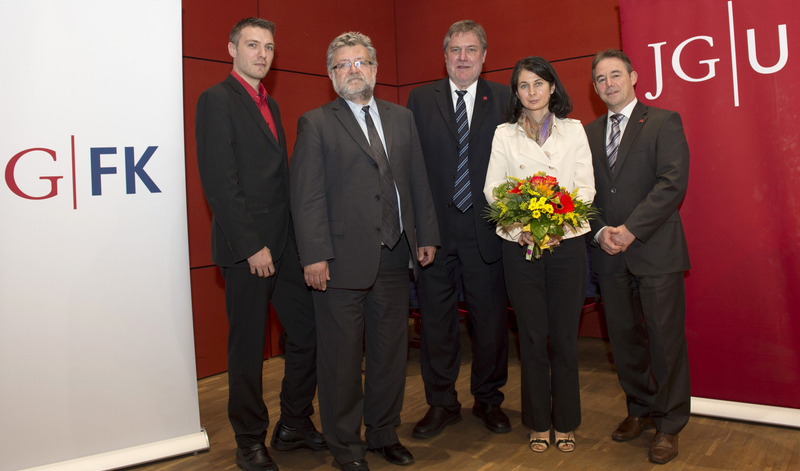 In an evening ceremony held on the campus of Johannes Gutenberg University Mainz (JGU), the Gutenberg Research College (GRC) presented the Gutenberg Research Award 2013 and welcomed its new fellows. "Our celebration has now already become a regular occasion to raise awareness of the outstanding research areas at our university and to forge contacts with other leading researchers," said Professor Dr. Matthias Neubert, Director of the GRC and head of the Theoretical High-Energy Physics group at JGU. "We would especially like to use this celebration, now being held for the third time, to honor the excellent academics at our university and to pay tribute to an international researcher through the granting of the Gutenberg Research Award." This year’s award was given to the quantum physicist Professor Dr. Maciej Lewenstein, who heads the quantum optics theory group at the Institute for Photonic Sciences in Barcelona, Spain. Johannes Gutenberg University Mainz established the Gutenberg Research College in 2007 to highlight the university's academic strengths and to promote promising new research fields. Individual academics and researchers are provided with support in the form of fellowships. The awarding of fellowships is the most important strategy employed by the GRC. This year, two new fellows have been officially introduced as new members of the GRC: the economist and education researcher Olga Zlatkin-Troitschanskaia and the particle physicist Matthias Schott. Prof. Dr. Olga Zlatkin-Troitschanskaia has held the chair of Economics and Business Education at JGU since 2006. Since her appointment at Mainz, she has attained a considerable reputation among both the German-speaking and the international research community in the field of economic and educational research. Besides, she has achieved extraordinary results in the support of young researchers. With the fellowship, the GRC recognizes her success and wants to support her future activities at JGU. Dr. Matthias Schott, Junior Professor of Particle Physics, has been appointed to a Lichtenberg Professorship at JGU in early 2013 and is currently building up a research group with support from the Volkswagen Foundation. He will focus on the highly precise measurement of the mass of the W boson, the particle that mediates the weak interaction. The team is part of the Experimental Particle and Astroparticle Physics (ETAP) group at JGU, and its investigations will be conducted primarily at CERN's Large Hadron Collider (LHC) near Geneva. The results of these precise measurements should help us to better understand the structure of matter. The project has particular significance in view of the recently announced discovery of the Higgs boson at CERN and is closely linked with other research activities in the new Cluster of Excellence PRISMA. This year's Gutenberg Research Award winner, Maciej Lewenstein, works in the field of quantum physics and has been involved in an extraordinarily broad spectrum of research areas, including quantum optics, the quantum physics of ultracold atoms and other many-body systems, the theory of quantum information, and attosecond physics. Thanks to his numerous and highly-cited publications, Lewenstein enjoys a reputation as excellent researcher. He has played a critical role in explaining phenomena in quantum physics, for which he has received numerous prizes and endowments, such as a fellowship of the American Physical Society, a Humboldt Research Award and an ERC Advanced Grant.